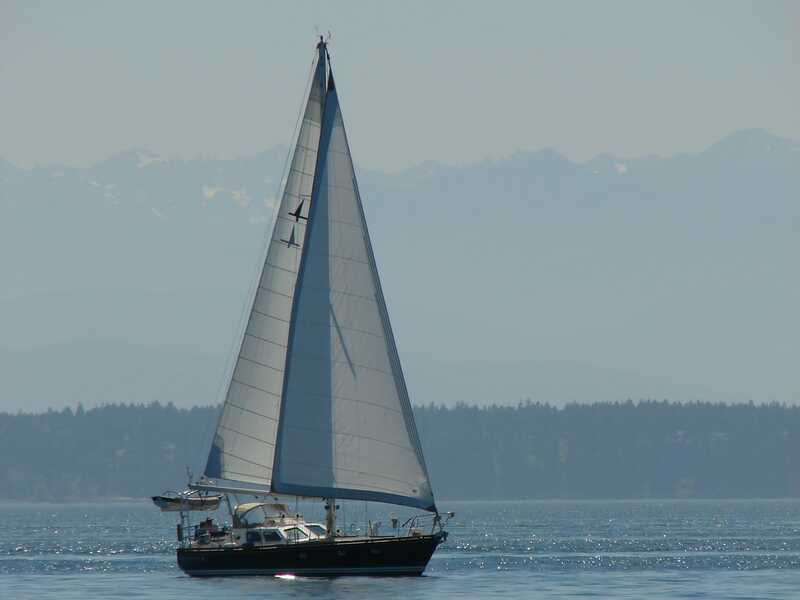 NOTE: The Amazon 44 sailboat named Nomadness has been sold and renamed No Pressure, and in November 2016 the new owner sailed her from Friday Harbor to San Diego. I have moved aboard Datawake, my new 50-foot mothership with geeky lab console, machine shop, 3D printer, piano, and other tech goodies. I’m keeping this “for sale” page online to provide history and tech information for others who love the Amazon steel boats. I go into the personal narrative about this over in the blog, but the upshot of the whole thing is that I am falling right into the Dark Side cliché… this paleo-geek is stepping off his sailboat. As a result, somebody is going to get a real gem that’s just about ready to go gallivanting across oceans. This page gives specs, details, and equipment lists. 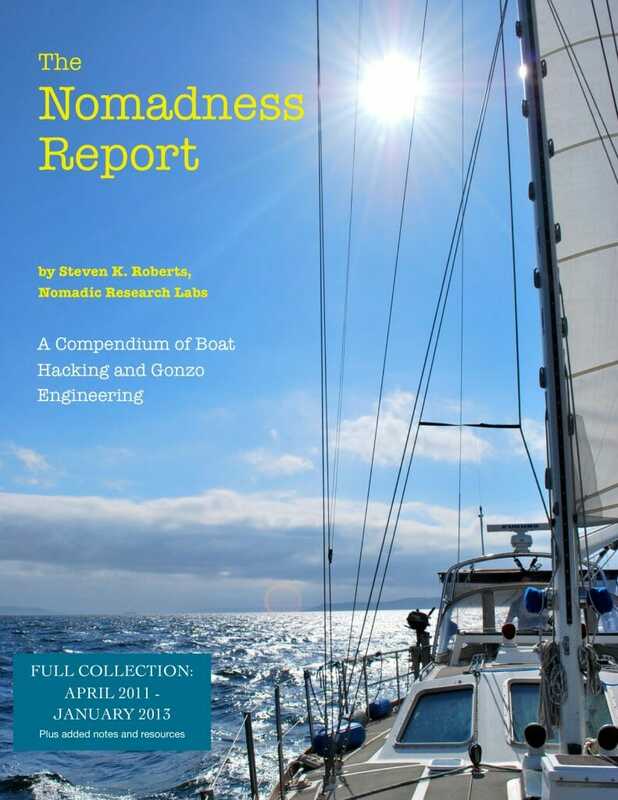 I have published a lot of information about Nomadness, projects various, and even a few cruising tales with the boat. To get acquainted, you can start with both my Nomadness Walkthrough and the excellent Adventure Sailing in Comfort review posted by Melissa White; both have lots more photos, including the unusual lab/studio region that provides sprawling workspace if you want it (I have restored the original salon table and seating, but the desk can easily go back… or you can have both). Randall Reeves carefully considered the boat for his Figure 8 Voyage. There are extensive details in the 200-page compilation eBook of the Nomadness Report that I published from 2011-2013, and a blog post discussing some of the more personal aspects of this decision. Given that background material (all those links open in new browser tabs), I’ll skip the general introduction and dive into the details. One of the unusual things about this boat is the extent to which the entire process has been documented publicly. This has been part of the 30-year trajectory of my technomadic projects, and I’ve been sharing designs, puzzles, problems, victories, new toys, vendor choices, and fabrication methods every step of the way. 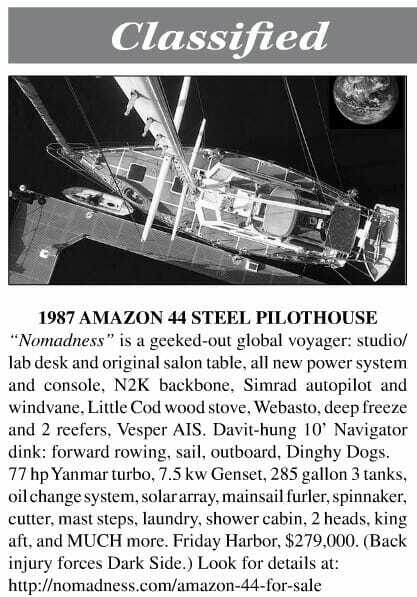 Compared to the usual sketchy data, there is lots of info about Nomadness in the book, the blog, an 11×17 documentation binder, engine and other manuals, the organized file box of systems literature, an encyclopedic reference book, and a PDF library. I purchased the boat in late 2007. Over the ensuing years I made substantial additions (wood stove, sailing dinghy with forward rowing system and outboard, NMEA2000 network, AIS transponder, LED interior and nav lighting, Simrad autopilot, new custom power distribution console, AGM battery bank, networked Outback power management system, solar array and charger, water heater, holding tank, N2K fuel monitoring system with Wema sensors, and more). 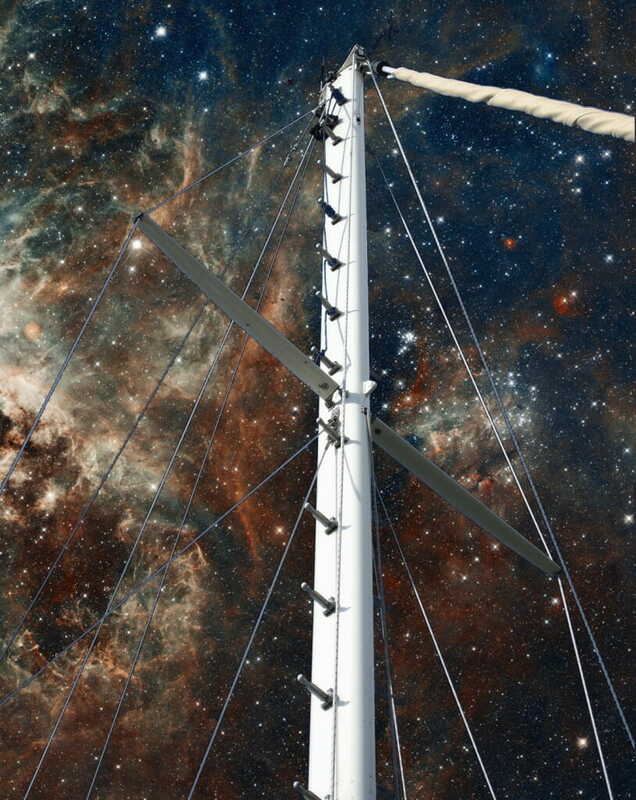 I will also include a second custom stainless solar array substrate ready to mount aft over the davits in addition to the existing one over the cockpit, a spinnaker and pole I’ve never used, inner forestay, spare prop, two salon configurations (see below), and quite a few other goodies. On the other side of the equation, there is some deferred maintenance. The fabric dodger is tired… still perfectly functional, but no longer pretty. 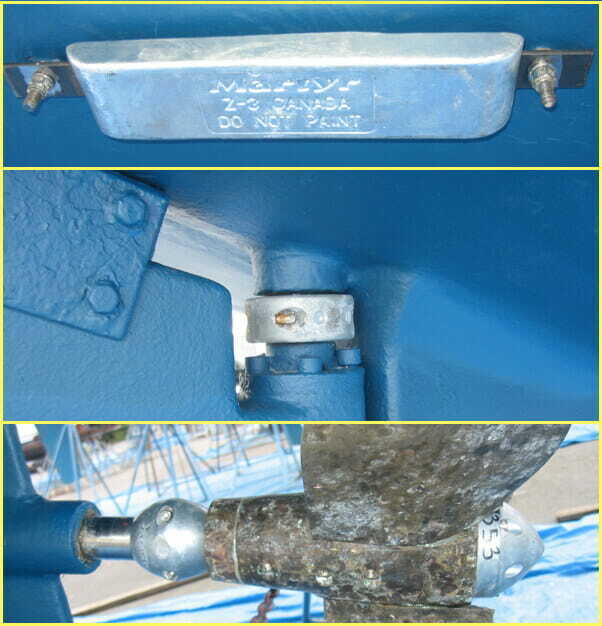 The shipyard long ago installed aluminum opening ports (ten total), and the six along the forward hull sides have set up a galvanic interaction with the steel hull… this will take new stainless portlights and installation surgery to make perfect. There’s some rust around the anchor locker and the toerail tangs that could use a needle scaler and some proper prep/Awlgrip work, and the hull sides have been scuffed by dirty fenders over the years. All that metal and paint stuff is going to cost money during a haulout, and it’s getting near time for a bottom job anyway (my last was at the end of 2010, though a diver a few months ago cleaned the running gear and said the hull still looks fine). What else? That depends on how “Bristol” you want it. There are minor unfinished projects that should be done… like putting a pantry in the region that used to have an awkward AC breaker panel, and prettying up the nacelle over the chart table where I removed old instruments (now a very handy bookshelf). 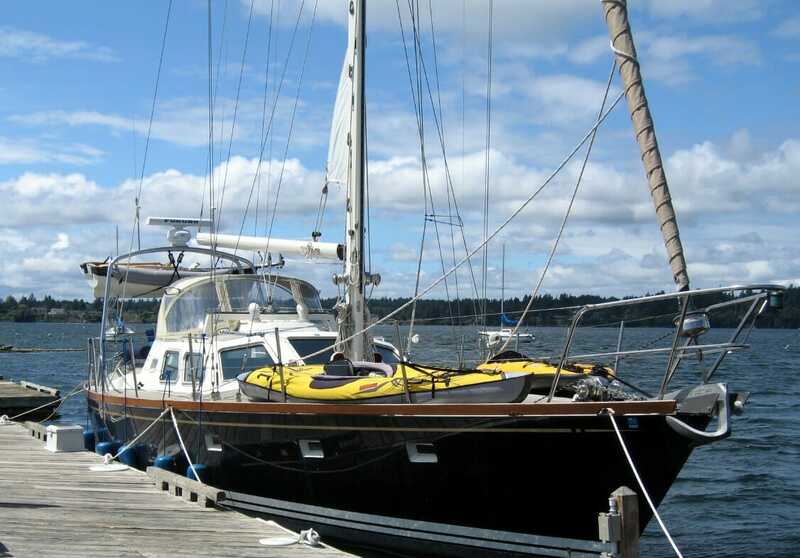 The halyards are safe-but-stiff and could stand to be replaced. 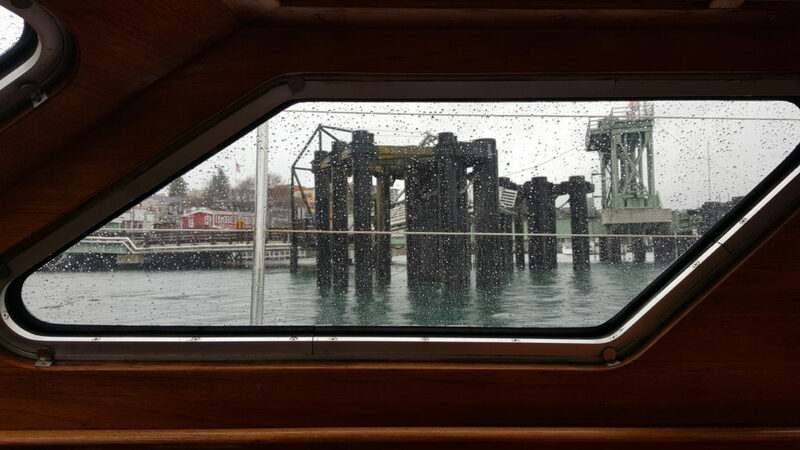 And two of the sloping forward pilothouse double-pane windows have some water incursion and should be swapped out (glass or polycarbonate). As to the market for voyaging sailboats of this scale, it softened a bit after 2007, then recovered… and well-found steel pilothouse cutters built properly in shipyards (not back yards) are very hard to find. The Amazon 44 is a rare bird; somewhere between 10 and 20 were made… many of which have circumnavigated. NOTE from January 2016: All that “make her sparkle” stuff indeed happened, and was a huge project… I’ll post a piece with new photos soon; this page is seriously out of date! If you haven’t already, please take a few minutes to look over the walkthrough of the boat. It is a good general introduction, and there is no need to replicate it here. Oh, and don’t forget the review! 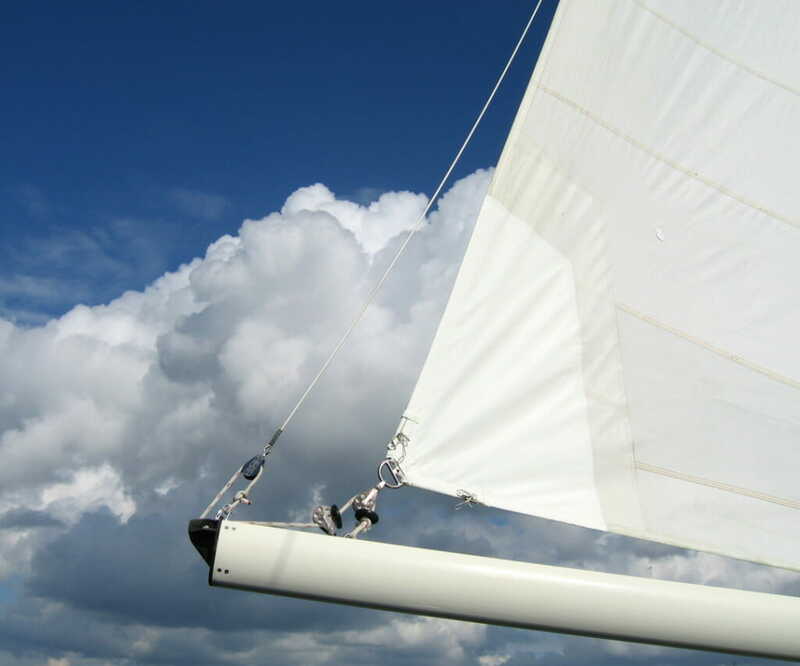 This machine is made for offshore voyaging, and supports single-handed sailing with all running rigging in the cockpit… including the control line for the Hood in-mast furler, main and genny sheets, headsail furler, and traveler. 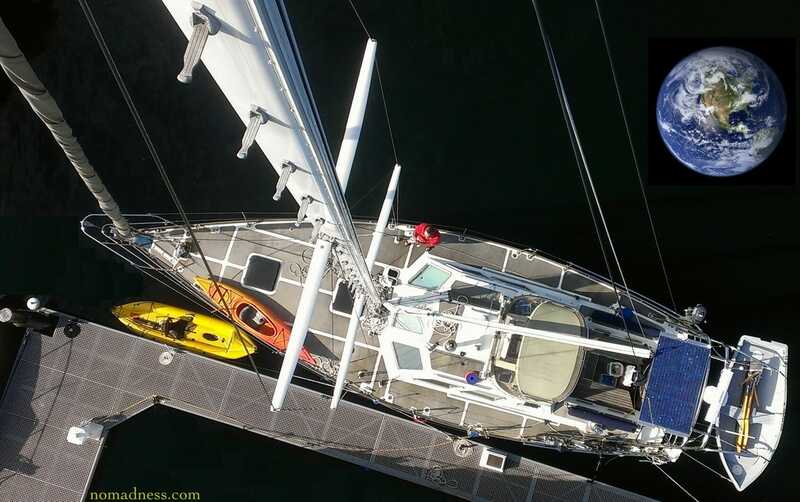 A couple can take this boat on a crossing, without need to have both people on deck to tack or shorten sail. Nomadness is cutter rigged, as you can see in the sailplan above, though I have never used the inner forestay and the wire is coiled below. 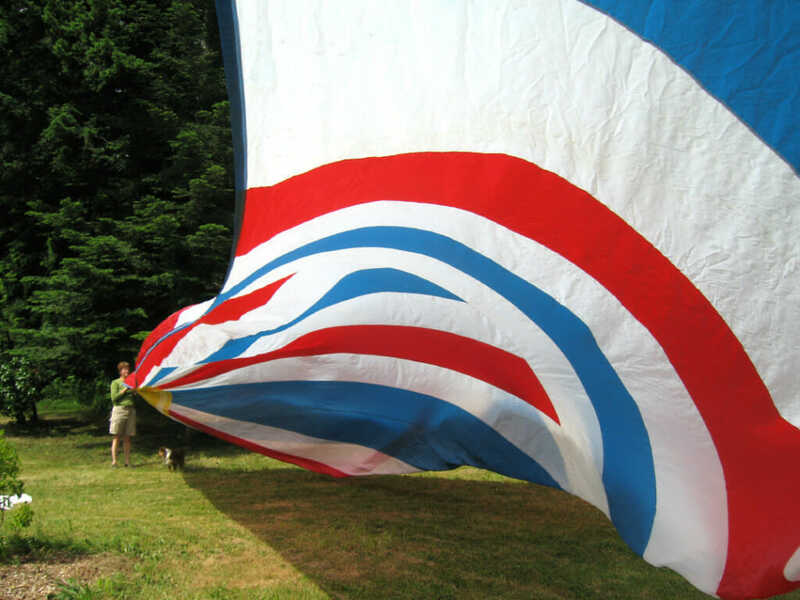 The sail inventory that came with the boat includes a spinnaker (along with pole, sheets, and hardware,) which I have never used… though we did set her aloft one day on Camano Island! One of my great regrets is that I never had a chance to rig this and scoot downwind under the chute. She handles exceptionally well under sail, with a motion that I can best describe as “stately.” The cockpit is dry, even in sloppy seas, and she’s easy to steer, whether with wheel or autopilot, from inside or out. On the shelf in my lab is a brand new Sailomat wind vane self-steering rig, fitted to the boat before I bought her but never used. This is available separately for $2,250, which is what I paid for it… if you’re not heading offshore, you don’t need it and I’ll just put it on eBay. Motoring, she runs about 1 gph at 6.5-to-7 knots, which makes for a pretty decent range of about 1,800 miles with the Yanmar 4JH-DTE at purring RPM (I usually run around 2400). There is an oil-changing system with clean & dirty tanks and a bidirectional pump, so if you’re doing maintenance underway you don’t have to deal with the sloppy draining problem. 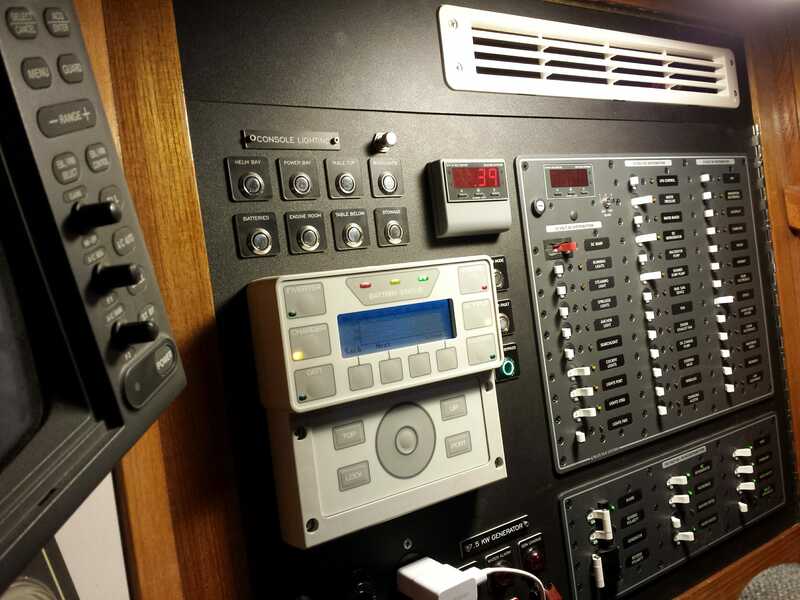 On the fuel side, there are three tanks, and one of my projects was tossing the sloppy swing-arm level senders and their shared analog meter… installing instead a trio of Wema sensors with Maretron TLA-100 interfaces feeding my NMEA2000 bus. 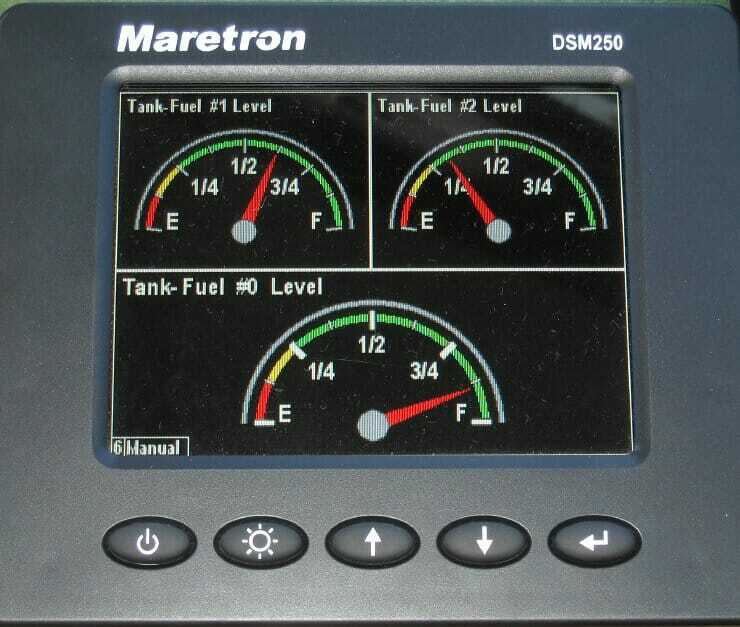 At right, you can see the display on the DSM250 before my last fill-up, with #1 and #2 being the port and starboard tanks and #0 being the larger aft tank (285 gallons total, I believe). The system also includes two Racor filters with vacuum gauges and valves to allow swapping, plus a transfer pump that lets you polish fuel between tanks (you can also draw from one and return to another, allowing polishing underway). 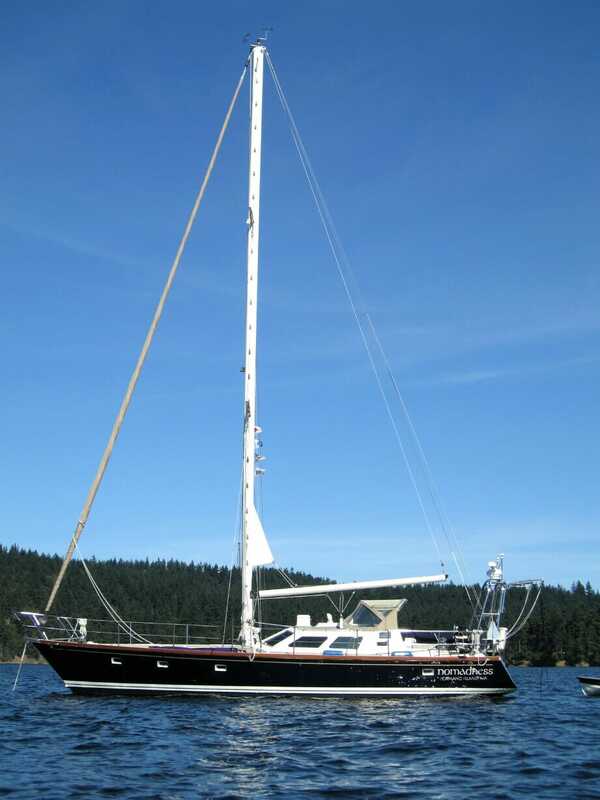 I have lived aboard for over 2 years at the dock in Friday Harbor. My biggest cruise was the summer of 2008 (GPS track at left), a languid and romantic journey that incorporated countless learning curves, the refinement of objectives, a sampler of the cruising lifestyle, and even some of the classic “fixing your boat in exotic ports.” Enroute and underway, Nomadness turned heads, inspired confidence, and moved gracefully. She also offered amazing comfort… with wood stove and diesel Webasto heat sources, efficient galley, king-size bed, great sound system with iPod dock and Sirius satellite radio, warm wood interior, washer-dryer, separate shower cabin, two heads, forward lounging cabin, comfortable computer workspace, huge foredeck for kayaks, dinghy davits, flat chart stowage, heavy ground tackle with 300′ of chain, and that overall sense of security you get from a steel hull. I know, that paragraph sounds like broker-BS… but it’s true. I’ve lived with this boat for six years, and if it weren’t for this damn back I’d be crossing oceans by now. This isn’t easy. OK, enough with the rhapsody! Let’s get down to equipment specifics. First, it is important for context to understand what my intent was for this boat. Many folks were wisely advising me to just GO, and not spend so much time fine-tuning and installing systems… but there is more to my mission profile than basic cruising. I was building an on-board electronics lab and audio production studio with full-size digital piano in a drawer, distributed network of embedded data collection nodes feeding a database-backed server with a browser front-end, extensive communication tools far beyond the usual marine and ham radio, 420-watt solar array and other power resources for maximum autonomy, and a whole suite of navigation systems including an AIS transponder and autopilot with wireless controller. As such, I spent a huge amount of time and money on system infrastructure, and that’s going to make life much more pleasant for her next skipper. Some of this was purely in the domain of serviceability, since the old power panels required a willowy contortionist anytime something needed to be done! I also completely re-did the internal power-management system, tossing the noisy old inverter-charger and doing it right with Outback hardware… with detailed monitoring tools on the console in addition to networking. That panel above, machined on the Bridgeport mill in my lab, provides all AC and DC breakers, built-in digital multimeters for both domains, a graphic display for charge monitoring and battery bank history, internal console lighting, genset controls, and utility outlets. 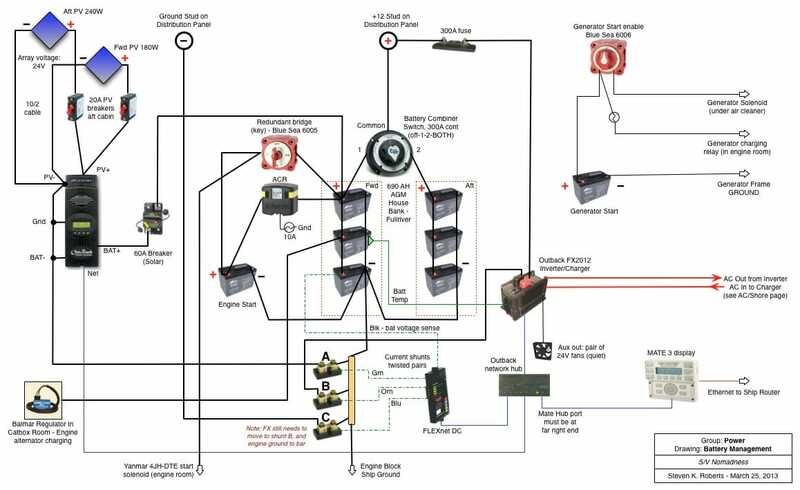 It opens horizontally for service, and behind it is the distribution region, a Charles isolation transformer, and the whole Outback network. 180 watts of photovoltaics are now over the cockpit and working reliably. 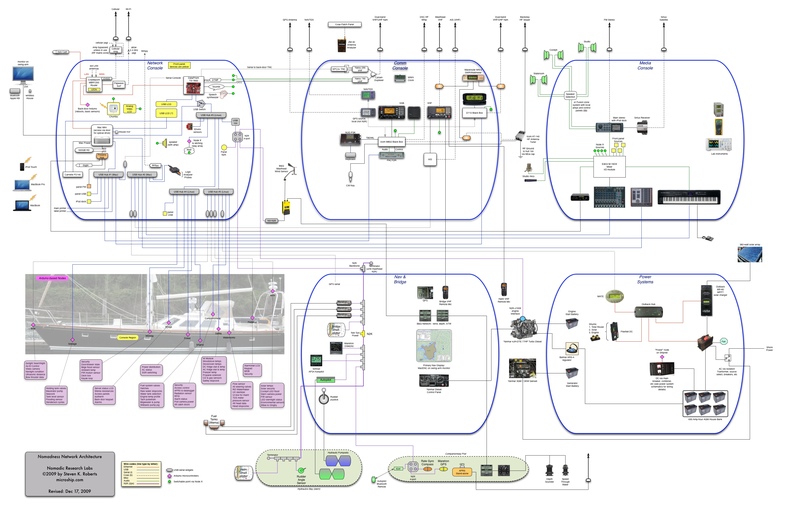 And I’ve done proper schematics, which will be included in a documentation book about the whole system. By the way, that Charles transformer was an expensive but important addition… the entire power system of Nomadness is completely isolated from the shore. Boats typically have galvanic isolators, but this takes it much further. Incoming shore power (through a SmartPlug) passes through a breaker and then terminates at this transformer; everything from there on uses the ship as a ground reference. Having that huge workspace aboard is an absolute joy, and makes projects much more pleasant. The desktop is a well-supported laminated structure 1.5″ thick (maple), with a 16×32 area of sheet steel in the middle to allow tools, lights, and instruments to be magnetically held in place underway. It is wide enough for an 88-key digital piano, as well as a trio of 19″ rack spaces for gear and an arm-mounted computer. You’ll see some references in various publications to my new SSB rig (Icom M802 and PACTOR), but I’m keeping that since the communication console was never completed and it’s just floating around loose in the salon. But there is a backstay sloper that is proven to work beautifully with the standard marine remote tuner configuration, and I’d be happy to coach you through replicating it (or sell you my existing AT-140 tuner and buy another one, which would be less work for both of us). 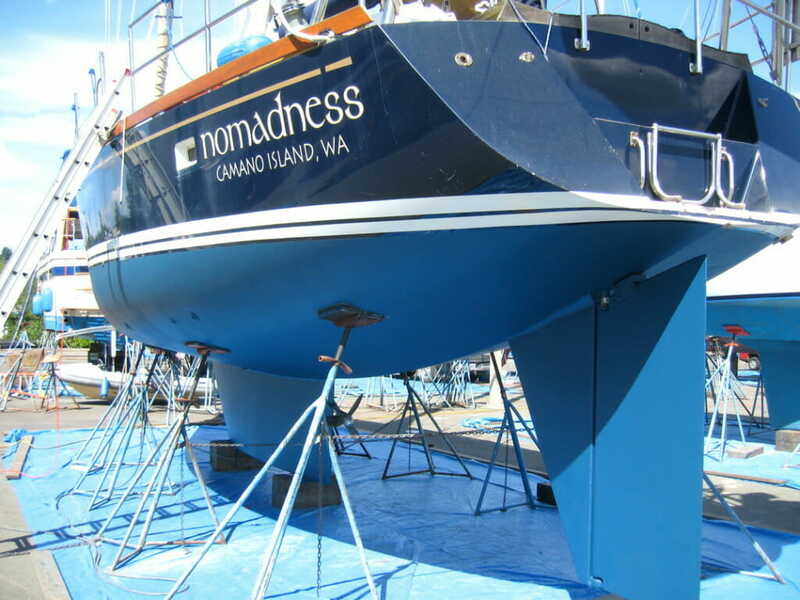 The Nomadness galley is one of her best features… the previous owner did a huge refit in 2002 that included separate top-loading fridge and freezer with massive insulation, Grunert dual holding plate system, and AC compressor. I’ve added a new salt-water pump for the heat exchanger, and the whole system just hums quietly. You can turn it off and still have frozen food 2-3 days later. 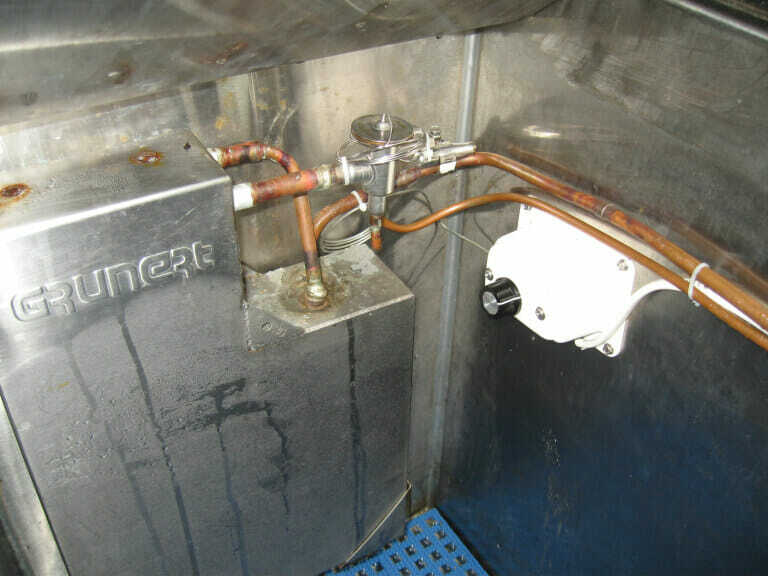 The fridge and freezer have bottom drains that are plumbed to a manifold shared with the shower drain… so the same pump can be used for any one as needed (three stopcocks). This makes cleaning very easy. 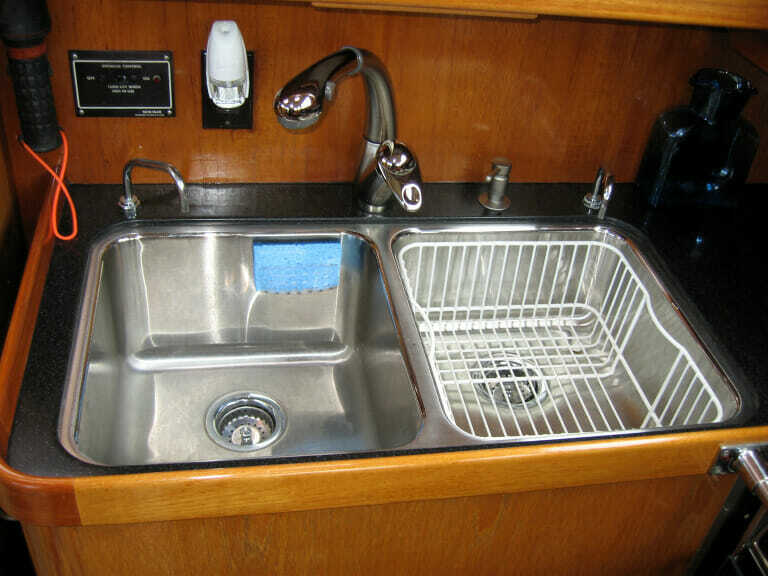 There is also a Sea Frost DC front-loading fridge under the galley wing counter, an excellent microwave, LED lighting under the cabinets, double sink with salt-water foot pump in addition to fresh pressure water, hot water from the Isotemp, and a beautiful gimballed LPG Princess 3-burner marine stove with oven. The freezer is under the lift-top desk at the chart table, and it’s been a real pleasure having a reliable source of ice cream aboard. 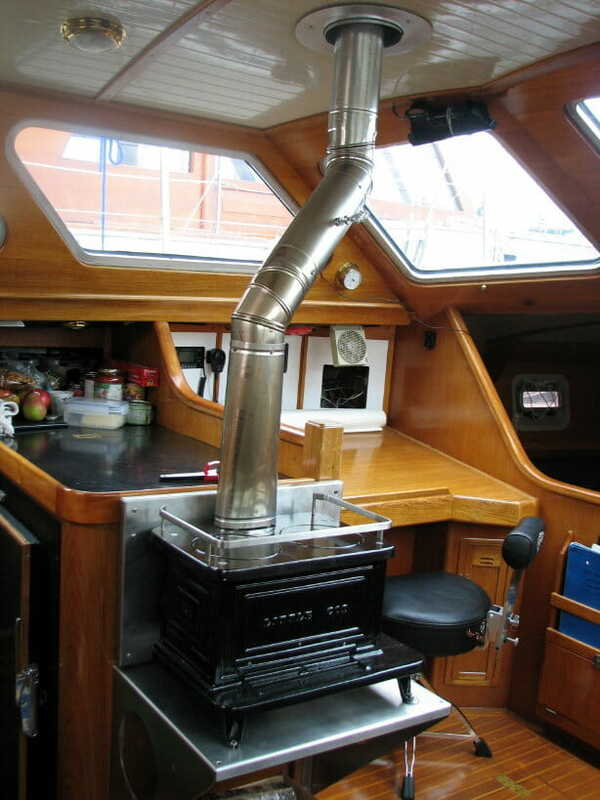 The other furnace is a Webasto Airtop 5000, which sips diesel from the starboard tank and distributes warm air throughout the boat via ductwork. It makes the boat toasty on even the coldest winter days. I mentioned the water heater – this is an Isotemp “Slim Square” that I installed in a little cabinet behind the dedicated shower cabin. The location is perfect, since little precious hot water is wasted between there and the shower head! This model is electric (about 700 watts) and heats quickly, and it has an additional heat exchanger intended for the engine coolant loop. Personally, I’d be nervous about doing that, but have been planning to add a thermal solar collector atop the dodger with a dedicated closed-loop system and small solar pump… automatically heating shower water whenever the sun is out. The output of this is distributed through the boat alongside cold, using a conventional demand water system with a pressure tank to prevent frequent cycling. It works fine. And, drool-worthy to many visitors, there is a Splendide Comb-O-Matic washer and dryer concealed behind a cabinet door. Also in the plumbing department, the boat has two heads (both Lavac). They work fine, though one of the items on my project list was to investigate changing the aft one to a macerating electric for increased comfort, as the Lavacs are small. 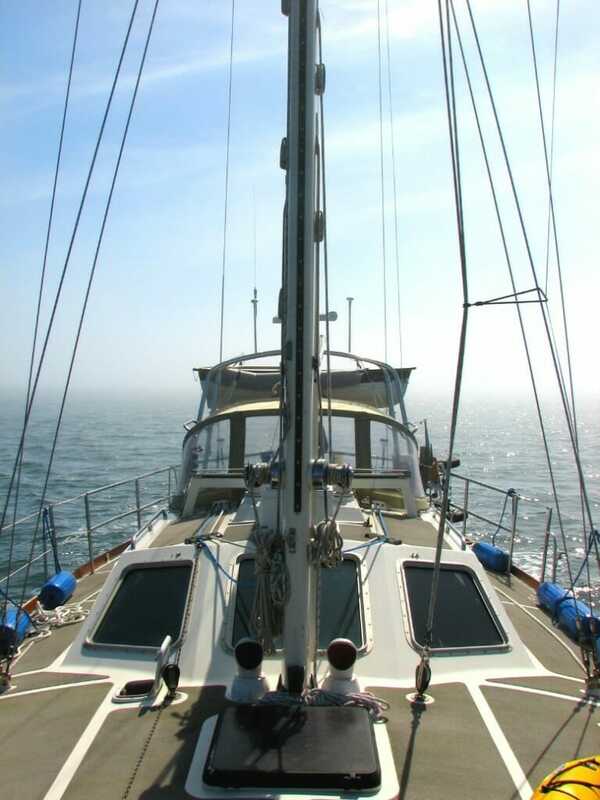 When I bought the boat, it was using a LectraSan treatment system, which is still aboard…. 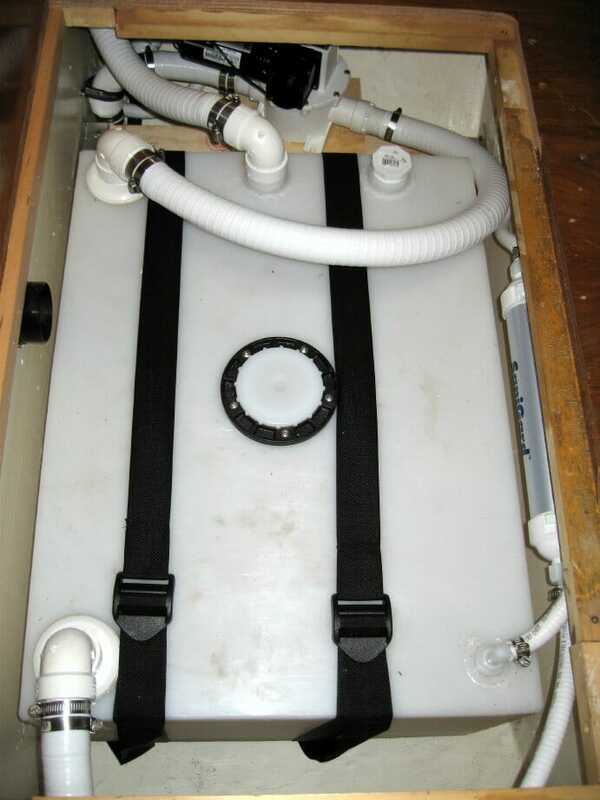 but I separated the fore and aft systems and installed a holding tank under the V-berth. This has both a deck pumpout and an overboard discharge with the indestructable T-12 macerator pump, and since taking that photo at right I have rebuilt the filter to allow recharging with inexpensive bulk activated charcoal instead of overpriced cartridges. I briefly discussed the fuel system earlier, with a valve matrix handling three tanks, two Racor filters, and a transfer pump. 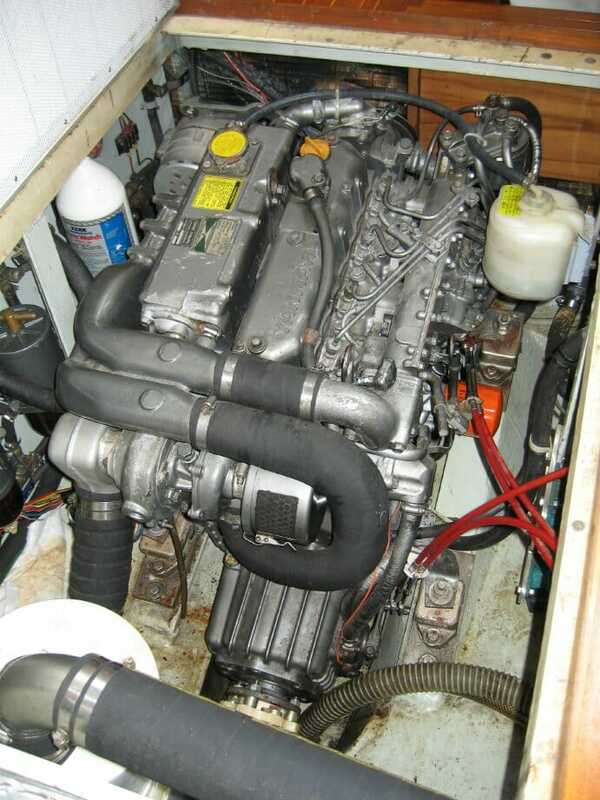 The main engine is a 77-horsepower turbo Yanmar 4JH-DTE with about 3100 hours, and it has had laboratory oil analysis twice (available for inspection and part of the ship documentation library). It stays well within temperature range and receives adequate aspiration. I have had the injectors patterned, a new raw water impeller, and general inspections in addition to oil changes. It purrs very nicely and runs clean, with wet exhaust and a freshwater heat exchanger. 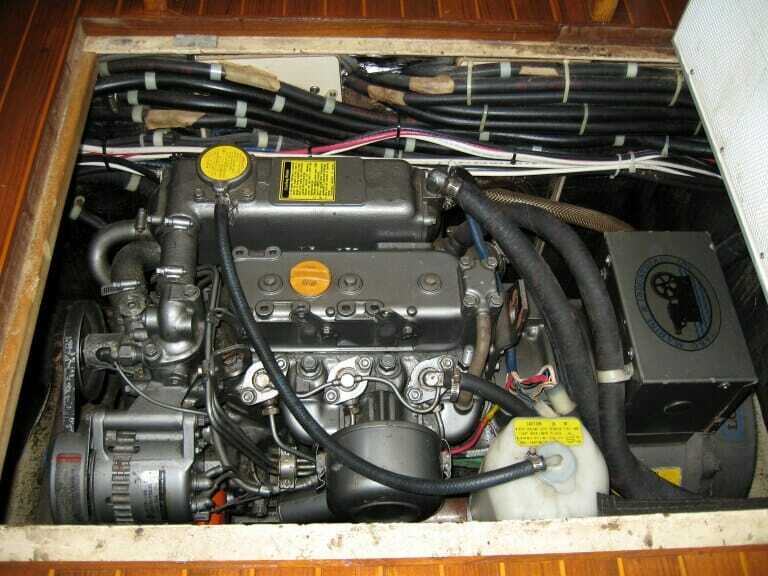 Just aft of this is a Yanmar 3GM that runs the 7.5 kilowatt generator. This has had the same oil change schedule, and also runs smoothly. There is an automatic halon fire extinguisher system in the engine room, along with very good acoustic insulation. The boat is steered by a single huge Wagner hydraulic cylinder driving the quadrant, and this has three inputs: the pedestal wheel in the cockpit, a manual joystick-operated pump system at the inside helm, and the new Simrad autopilot that I installed (replacing an old Robertson that came with the boat). Significantly, I tossed the old power-hog continuously running pump and replaced it with one that sips current and quietly indexes only as much as necessary. This is of course on the N2K bus, so can steer to waypoints in addition to holding a compass course or emulating a wind vane using masthead data. The wireless remote is wonderful, and my favorite way to drive the boat… I just hang out on the foredeck or wherever, nudging her as needed and enjoying the view. Speaking of the view, here’s a peek at her bottom… from a haulout in the brutally hot August of 2010 in a boatyard in Olympia. Before the bottom paint, coached by the coatings experts in the yard, I took any dubious patches down to bare metal, acid-etched, and coated with multiple timed feathered primer coats. After completing all the prep (even the bottom of the keel), I stepped back and let their guys do the bottom job. I chose Micron 66, a self-polishing copper-acrylate copolymer that does not use TBT. Antifouling is one of those subjects that leads to endless passionate discussion, and after discounting others that have not worked well for me and factoring in the steel hull and northwest usage pattern, I opted for this top-of-the-line Interlux product in the hope that it would delay my next haulout by a year… and it did. We went with a red indicator layer covered by blue, both with cayenne pepper added. The prop is a 3-blade Max-Prop, which I have kept regularly zinc’d. 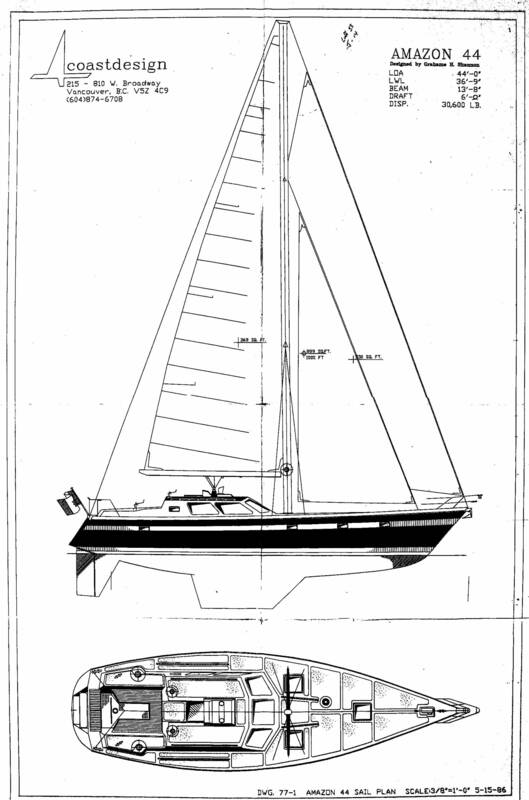 Draft is 6 feet with a modified fin keel, and the rudder is a spade with structural skeg. 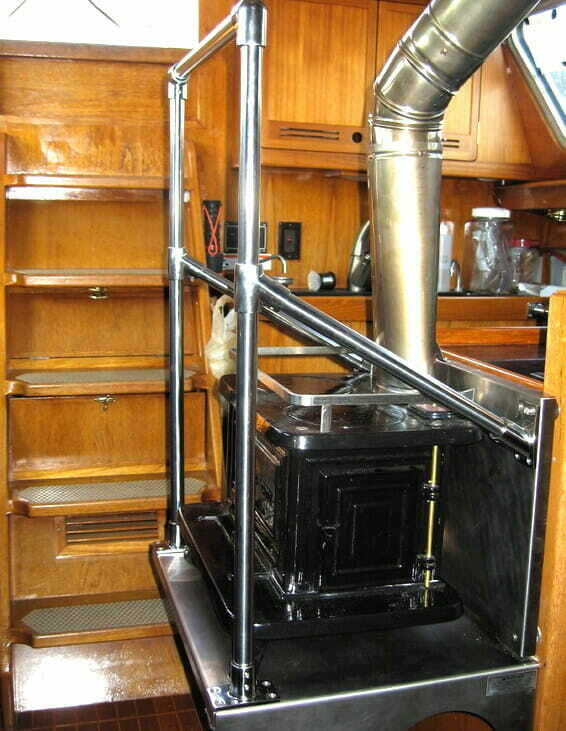 The deck is largely covered with Treadmaster (wonderful stuff) and surrounded by stainless pulpits, rails, and lifelines (with a gate to the integral swim step). There are padded backrests in the cockpit, and a flip-up teak table. Finally, the dinghy is a Gig Harbor 10′ Navigator with forward-facing rowing system, Dinghy Dogs flotation tubes, a sweet sail rig with jib, and a 2.5 HP Yamaha outboard (new in 2011). It hangs from fold-out davits mounted to the radar arch, and is a very capable boatlet. Plating thickness: 3/16 welded steel on 3/8″ x 3″ steel frames and 1/4″ x 1.25″ longitudinals. Keel face plating is 3/8″ and bottom/top keel plating is 3/4″. Photo from masthead by Wojciech Wacowski, with a little help from NASA and my editing tools. Yes – thanks for asking! Wow… what a beautiful beautiful boat. If only I had that kind of cash on hand. What happened to your back? Do you have photos and/or layout drawing for down below including the cabins? I couldn’t find the sleeping areas. What is your current asking price? Also, is the boat currently Canadian or US registered? Hi Ray, and sorry for the slow reply. I don’t have any drawings for the cabin layout, but can email you more photos if you like. The boat is US Documented (though was built in Canada), and I just dropped the price today to $250K. Cheers! Hi Steve. It looks like some very impressive boat computing projects you have going on, that’s for sure. I see you’re bringing many sensor inputs into a central monitoring app. Each arduino supports a different one? Wondering if you have any strain gauges in the rigging, (or strain gauges of any type). I’m not sure how safe they would be, actually. But, it sure would be a warm fuzzy when it’s blowing 50 kts.